When one thinks of West Indies cricket, the first thing that springs to mind will be their intimidating and seemingly never-ending supply of quick bowlers which helped them rule the 80s. More than a couple of decades later, Australia are now dreaming of unleashing their own four-pronged pace attack in a bid to spark a turnaround in Tests. Speaking to Wide World of Sports, Australia’s head coach Darren Lehmann revealed his blueprint for the team’s immediate future with the likes of Pat Cummins and James Pattinson being a huge part of those plans. At the height of their prowess, Clive Lloyd’s West Indies team had Sir Andy Roberts, Michael Holding, Colin Croft and Joel Garner sending shivers down opposition spines with their exploits. All four played together only for 11 Tests with only one of those ending in defeat. But, invariably, any three of those pacers operated in tandem from the late 70s to the early 80s. Gradually, Malcolm Marshall emerged and joined in on the action from the mid to late 80s. Between March 1980 and March 1995, West Indies did not lose even a single Test series both home and away. However, Australia are currently in a transition phase and may not have such far-reaching aspirations. Following a 0-3 whitewash in Sri Lanka, Steven Smith’s team lost the first two Tests of the home series against South Africa. Upon suffering five losses in a row, they did bounce back by snaring a consolation victory in the day-night encounter at Adelaide. 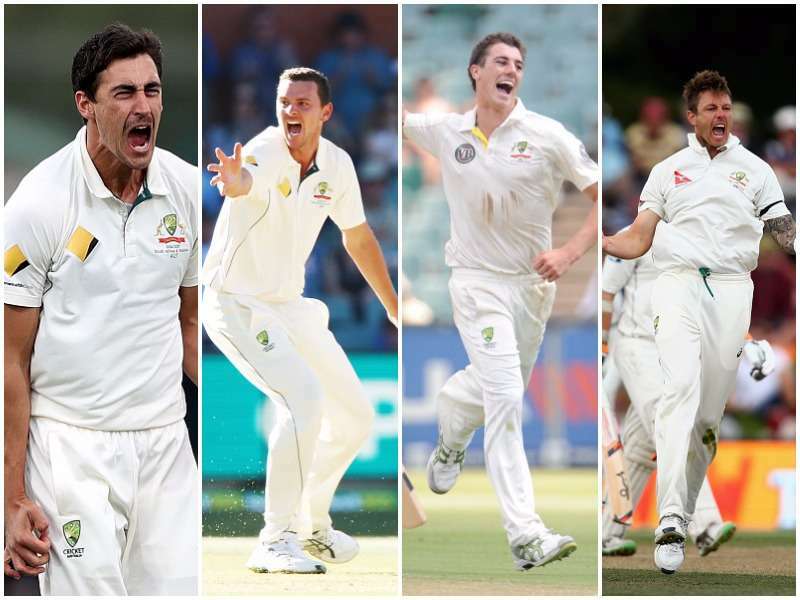 With Starc and Hazlewood establishing a threatening new-ball pairing, the Aussies await the return of Cummins and Pattinson in order to complete their bowling attack. Though the duo are often injury-prone, their recent comebacks at different levels have raised expectations. While Pattinson recently returned to grade cricket, Cummins bowled at significant pace during the first two home ODIs against New Zealand and picked up six wickets in the process. The 23-year old could add to his solitary Test cap as early as in the 4-match series in India early next year. Even if Cummins and Pattinson do not board the plane to India, they might return to the Test arena during the 2017/18 home Ashes and complete the four-man pace attack that Lehmann desperately wants. Teams who had successful test tours to England.